Cloud-based platforms are the difference-maker. Hotels are moving toward cloud-based solutions. This has become a modern way to simplify property IT demands while reducing the burden of adding new and innovative applications. However, properties will differ in how quickly they migrate to a pure cloud solution. To hit the aggressive Total Cost of Ownership (TCO) targets required to stay competitive, hoteliers need the flexibility to maximize the re-use of assets where required. ATD offers the ability for hoteliers to implement either pure cloud or hybrid cloud solutions, using the same stream of software for an ubiquitous experience for administrators and guests. Whether the voice application is located on-site or in the cloud, new hospitality applications are added in the cloud with seamless integration. 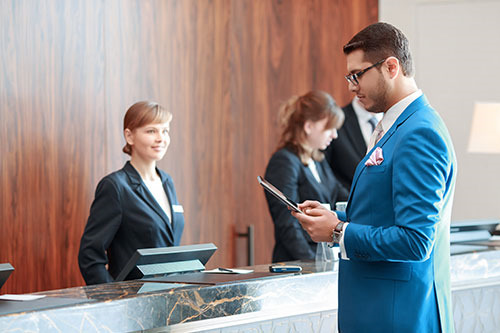 With ATD CloudConnect™ Hospitality, SIP handsets are supported directly, while existing analog phones are supported using an on-premise gateway. However, with ATD you decide which applications and at what pace you want to get there. By partnering with the undisputed leader in communications solutions for the hospitality industry and the fastest growing cloud communications provider, you can rest-assured knowing you will have the best path to the cloud.